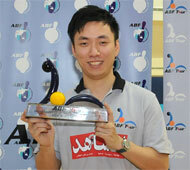 14th March, Kuwait: Wu Siu Hong of Hong Kong and Wendy Chai of Malaysia celebrated memorable wins in the ABF Tour - Tournament of Champions as Wu took his second win while Chai claimed her third women's crown on Wednesday. Wu, who won the 2006 men's title, defeated Eric Tseng, 267-164 in an all-Hong Kong men's finals and Chai, who won in 2003 and 2006, claimed her third TOC crown by beating debutant, Jo Hyun-Jung of Korea, 235-195 in the women's title match. Top seed, Wu had to work hard to earn his place in the finals during the first semi-final match against Kuwaiti favourite, Mohammed Al Zaidan. Both were locked at 225 and were force to paly off the 9th and 10th frame to break the tie. Wu started off with a strike as Mohammed rolled a spare in the 9th frame. The Kuwaiti roll a double strike thereafter but managed only 7 pin count for 47. Wu added two more strikes and an 8 pin count for 58 to edge Mohammed. In the title match, the champion doubled in the second and third frames as his team-mate, Tseng struggled with a split in the third and seventh frames. Wu then struck out from frame 5 onwards and cruised to a comfortable 267-164 victory. Wu also beat Thailand's Annop Arromsaranon, 228-213 in the quarter-finals. Tseng eliminated UAE's Shaker Al Hassan, 214-192 in quarter-finals and another Thai, Yannaphon Larpapharat 247-219 in the semi-final to face Wu. "Winning the title for the second time cannot be sweeter," said the 27-year-old Hong Kong national bowler, whose last title was the ABF Tour Saudi leg in 2010. "The training and competition in the US recently have helped me alot especially in handling pressure." Ironcally, when Wu took his first TOC title in 2006, the women's champion was Wendy Chai of Malaysia. And today, Chai was also crowned the women's champion to share the top podium spot with Wu. Chai sailed past Indonesia's Novie Phang, 205-139 in the secomd semi-final match after an earlier victory over Hee Kar Yen, 212-146 in the fourth all-Malaysian quarter-finals. The Korean runner-up defeated 2009 TOC champion, Sharon Limansantoso of Indonesia, 236-201 in the first semi. Jo had earlier defeated room-mate, Angkana Netrviseth of Thailand, 242-215 in the qurter-finals to advance into the semi. "I'm glad that we got the last minute permission to come to Kuwait to compete in the TOC," said the 34-year-old Wendy Chai. "I only bowled in the tour once last year and was very lucky to secure a spot in the grand finals. And winning it fr the third time is especially rewarding." Wu won US$20,000 as champion with Tseng settling for US$8,000. Both the losing semi-finalists, Mohammed Al Zaidan and Yannaphon earned US$4,000 each. Chai was richer by US$10,000 after emerging as champion. Jo took home US$5,000 for her effort while both the Indonesian women, Sharon Limansantoso and Novie Phang earned US$3,000 each. Mahmood Fetelah, Vice President of Kuwait Youth & Sports Council and Sheikh Talal M. Al-Sabah, ABF and Kuwait Bowling Federation President presented the trophies to the champions. Kuwait will also be hosting the second leg of this year's ABF Tour on March 20 after the 9th Kuwaiti International Open, the sixth stop of the WTBA World Bwling Tour from 15 to 19 March at Cozmo Bwling Center in Salmiya City. 13th March, Kuwait: Hong Kong men shone in Round 1 finals of the ABF Tour - Tournament of Champions at Cozmo Bowling Center on Tuesday with Wu Siu Hong and Eric Tseng finishing one-two and Joshua Chow making the cut for next round. 2011 Asian Championship Masters gold medalist and 2010 ABF Tour Egypt leg champion, Khaled Al Dubyyan started a blistering pace with 267 in his opening game to lead team-mate, Mohammed Al Zaidan by 20 pins. Another strong 255 in his second kept the Kuwaiti in the lead by 23 pins, trailed by Hong Kong's Eric Tseng in second after a superb 287 and Thailand's Yannaphon Larpapharat third, a further 20 pins. Another big game of 278 from Tseng put the Hong Kong national bowler in front as his compatriot and top qualifier, Wu Siu Hong, who almost shot the tournament's first 300 but settled for 299, to take up second spot. Despite a 215 in the fourth, Wu took over the lead and followed it up with consistent scores of 259, 223, 214, 237, 238 and 247 to end the round with 2404 and advanced in to the knockout stage as top seed. Tseng trailed Wu all the way to retain second spot and gave Hong Kong a one-two finish with 2351. Yannaphon did well to take up third spot with 2306 while Mohammed Al Zaidan ended better than Khaled for fourth with 2300. Khaled settled for fifth spot with 2246 with a second Thai, Annop Arromsaranon firing 256, 238, 246 and 258 in his last four games to earn his place in the quarter-finals in sixth position with 2243. UAE's sole survivor, Shaker Al Hassan took seventh position with 2202 while a third Hong Kong national bowler, Joshua Chow snatched the final and eighth spot with 2187. The biggest loser was undoubtedly Thailand's Surasak Manuwong, who fell to 12th with a disasterous 138 in his final game after being in the top 8 for most of the round. 2009 TOC champion, Ryan Lalisang of Indonesia and last year's TOC champion, Hussain Al Suwaidi of UAE both failed to advance. Top seed Wu is drawn to face Annop and No. 2 seed, Eric will meet Shaker in the quarter-finals. No. 3 seed, Yannaphon will face Khaled and Joshua is matched up against Mohammed Al Zaidan. The first two women's quarter-finals matches will start tomorrow at 10.00am local time and the other two at 10.30am. The men's quarter-finals will commence at 11.00am. The four winners in both divisions will advance to the sem-finals. And the winners of the semi-final matches will meet in the title match. The men's champion will earn US$20,000 while the women will take home US$10,000. 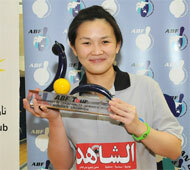 13th March, Kuwait: ABF Tour Hong Kong leg champion, Tannya Roumimper of Indonesia cruised into the the quarter-final round of the ABF Tour - Tournament of Champions after ending the Round 1 by a comfortable margin. 2009 ABF Tour TOC champion, Sharon Limansantoso of Indonesia got off to a great start with 248 in her opening game but was unable to match the pace set by compatriot, Tannya Roumimper taking over the lead after the second game. But the Indonesian women was overwhelmed by debutant, Jo Hyun-Jung after the Korean surged into the front with 242 and 258 in the second and third game. Jo held the lead after the fourth but a disasterous 156 in her fifth game saw her tumbling down to field as Sharon regained the lead at the halfway mark. Sharon had to share the lead at the sixth game after Tannya fired 268 but could not keep pace with her team-mate after Tannya followed it up with 279, 266 and 278 in the next three games. Tannya ended the round with 2401 and a comfortable 128 pins lead over Wendy Chai in second with 2273. A third Indonesian, Novie Phang took third spot with 2227 ahead of the Korean in fourth with 2215. Sharon settled for fifth spot with 2166 while the only Thai, Angkana Netrviseth finished sixth with 2142. Hong Kong's ex-international, Joey Yip stormed home with 225 in her final game to take seventh position with 2102. Indonesia leg champion, Hee Kar Yen of Malaysia squeezed into the quarter-finals in eighth position with 2093 while, Indonesia's Putty Armein who made a late charge, missed the cut by 21 pins to finished ninth. Top seed, Tannya will take on Sharon in the quarter-finals with No. 2 seed Wendy Chai facing team-mate, Hee Kar Yen. No. 3 seed Novie Phang will meet Joey Yip while No. 4 seed, Jo Hyun-Jung will face Angkana Netrviseth.